With the most sophisticated weather monitoring technology, the Orion LX™ Weather Station offers an easy-to-use, Internet-ready interface that is operational straight from the box. There are no moving parts to wear out or calibrate. Additionally, this Orion weather station does not require programming or complicated configuration. Although, we do have WeatherMaster software options available. 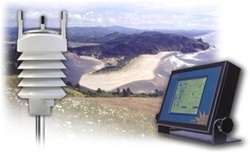 The Orion LX Weather Station consists of a high-tech, all-in-one sensor module and the Orion Weather MicroServer. Display options include computer software and Columbia Weather’s proprietary LCD touch-screen Display Console. Running Linux operating system, the powerful Orion Weather MicroServer provides FTP output, as well as a browser user interface for network applications. 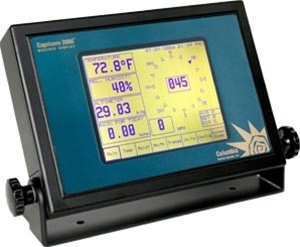 These industrial weather stations include two serial communication ports and datalogging capability. High accuracy and fine resolution make this new system ideal for precision weather monitoring. The Orion LX Weather Station's sensors meet FAA and WMO specs for aviation operations, as well as EPA requirements for scientific environmental monitoring applications. The wind sensor has no moving parts, which makes the Orion LX Weather Station maintenance free. The measurement range for wind speed is from 0 to 134 mph (0 to 60 m/s) and for wind direction from 0 to 360°. Barometric pressure, temperature, and humidity measurements are combined in an advanced sensor module on these industrial weather stations utilizing a capacitive measurement method for each parameter. The industrial weather station's rainfall measurement is based on an impact sensor, which detects the impact of individual rain drops. The signals exerting from the impacts are proportional to the volume of the drops. Hence, the signal from each drop can be converted directly to the accumulated rainfall. Due to the measurement method, flooding, clogging as well as wetting and evaporation losses in rain measurement are eliminated.